Discussion in 'Model X' started by dutchinchicago, Apr 15, 2016. I am hoping to get my Model X within the next 10 weeks or so. I am hoping to take some road trips with it. EV planner is awesome for this but I am never sure what model to put in. A model X 90D can do less mileage than a 90D but would it be closer to a 85D or a 75D and what wheels should I choose? My model X has 20" wheels. Apologies if this has been discussed and I missed it but we are planning our first short road trip. I'm using EVtripplanner. Anyone figure out what options they like best. I was trying to decide on equivalent "S" drop down option of 19" or 21" and a speed multiplier that would give me a realistic "Wh/mile" estimated value for good planning. 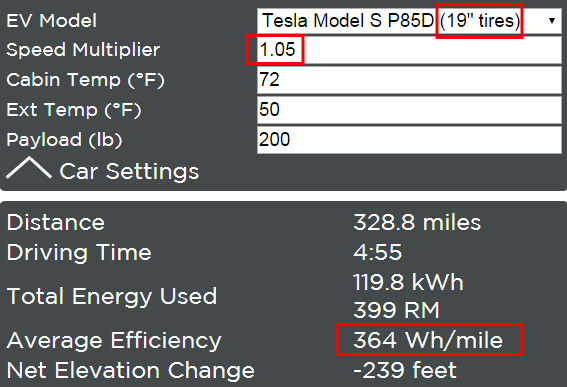 I realize there is more drag on the X vs S. As well HVAC (heat more so than A/C) has a pretty big impact. I was looking to see if other real-world users of this tool had suggestions. Speed: this is usually the biggest contributor to variation in energy usage. We use Google Map's traffic-based estimate of current speed, which you can adjust up or down with the 'Speed Factor'. Air density: this varies with temperature and altitude. The same level-road trip at a higher altitude takes less energy than at sea level since the air is thinner. Similarly, the same trip (without air conditioning or heating) takes less energy when it is hotter since the air is thinner. We determine altitude over the route using the Mapquest database and use your input for temperature. HVAC: the heater and air conditioner, as well as any energy required to heat or cool the battery pack, use energy...even when you're not moving. We look at your cabin temperature setting and your estimate of the outside temperature. On-board Systems: the computers and other on-board systems use energy, even when the car isn't moving. Weight & Elevation Changes: the weight of the car and payload (entered) are used along with elevation changes along the route to determine energy used climbing...and recovered during downhills. Friction, efficiency, regeneration: each EV converts electrical energy in the battery to mechanical energy at the wheels a little differently (and vice-versa). We account for these conversions and differences. Your Car Model: each car has different parameters for how they use energy in the categories above. EVTripPlanner takes the best data available to match our model to the actual measurements and published charts. Setting the parameters for your trip is critical to getting an accurate estimate of the energy that will be consumed. The most important setting is your "speed factor", which is how much faster or slower than the prevailing speed (as estimated by Google Maps at the time of planning the route) you are going on average. Unfortunately, you can drive in different patterns and have the same average speed while consuming different amounts of energy. While these errors don't tend to be very large for long trips, the closer to "cruise control" you are at the average speed on long segments the closer the estimate will be. Also fill in payload, outside and cabin temperatures and your correct car model - these can make a significant difference. No one said much but this. It looks like you picked two close cars. What about the outside temp at 50 degrees F? Is that realistic for CHG at this time of the year? It looks like a reasonable estimate for the IN and KY drive. For the 19", I basically played with the speed factor (1.05) to bring up wh/mile value to ~365. Just looking at some of the examples in this thread I thought that was doable if you drive reasonable and the road is generally flat (and mostly highway). I wasn't sure if this technique made since or if I should just go with the larger tire vehicle. Maybe it doesn't matter. Just thought others may have been through this or played with speed factor to get it to match their personal S driving. Has there been discussion and/or progress in adding the X vehicles to the program? What really helps range is keeping cruise control/ autopilot on. This makes it so that there are no unnecessary accelerations, which humans are very good at. Also keeping speed down helps, check the weather AND wind. Wind can be a silent range killer. Especially true in mountain driving. I add extra an extra 600 lbs over the S P90D on 21" tires and the wh/mi comes out close to my reality. How can we get EV Ttrip Planner the data it needs? "When will EVTripPlanner support the 70D, my electric scooter, or Tesla's newly released electric batmobile(TM)? ... if you want to help get a car supported faster, try to find reliable efficiency vs speed data (like this) prefereably published by the manufacturer of the car, and email it to me." I generally use the P85 with 21 inch tires. The X is about 800 pounds heavier, so I adjust the weight to 1000. The cabin is bigger so AC/heat has to work harder and the speed adjustment at 1.1 or 1.15 usually covers that in my belief. Check out the average wh/mile thread--that will give you a good range estimate in the real world. I've been right under 400 and more like 350 on the highway so you know how much range you'll get off the 90% charge or 100% charge. For example if you can get 400 wh/mile and charge to 100% you should be able to squeeze out 225 miles. 90k/400=225. As long as the next Supercharger or destination charging station is <225, you're good to go. Please everyone download and use Ben's software. His site is an amazing resource to plan trips, make multiple stops, etc and he needs data from current X drivers to be able to include reliable data on the SUV. Join your fellow Xers and download and install today. Looks like the Model X 90D has been removed from the trip planner. No Model X options currently. Just go to evtripping.com. It has X options and I like the design too! One on the swedish Tesla forum have put a lot of work into making a route planner that work both on the computer and on Teslas. After what I have read it's working great now but if you find anything strange it's just to report and he will try to solve the problem. Ben - I tried to use the EVTrip Planner this week in the car and using the Tesla Browser it pretty much impossible to get a correct page to display and enter data. The fields and sizes are all mismatched. Would it be possible to have a checkbox to allow for compatible Tesla HTML viewing using the Tesla Browser? I'm I missing something? 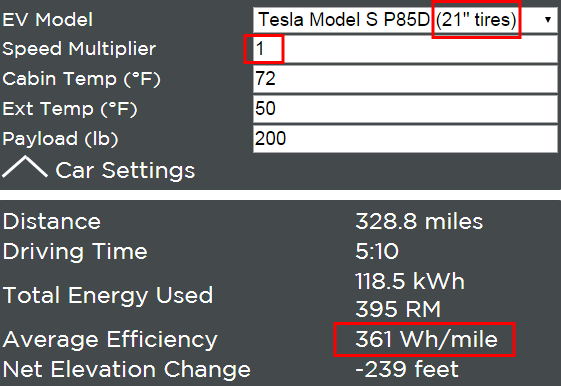 thanks..
For my Model X 75 I found the Model S 90D 21" to be pretty accurate with a payload of 500. Frankly the temp settings don't make much difference. I followed your instructions to use Teslalogs.com to collect the data. Now my car alarm is being triggered frequently. Has that issue been logged before?